This Salisbury teacup in the 'Rembrandt' pattern was one of the couple who really kicked my china habit into high gear, prior to that I'd just had half a dozen pretty vintage pieces but once I got my hands on this I somehow needed more! There is a site in the UK called Preloved, sort of an online car boot sale with users adding items they have for sale and would-be purchasers getting in touch with offers/to arrange payment and that is where this duo came from. Please excuse the wrinkled, creased tablecloth - I picked it up a few days ago from the Salvation Army and haven't washed and ironed it as yet! 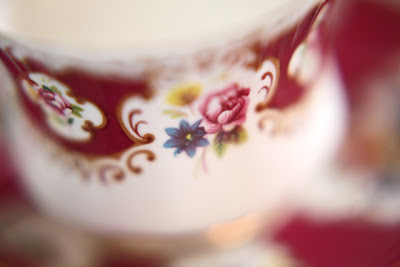 There is a snippet about tea I found online a couple of years ago that stuck with me, it was someone posting a comment online in response to the news of the London Bombings on 7th July 2005. I remember it was a surreal day to see it on the news and for me personally trying to get in touch with a couple of friends who I knew would have been travelling on the Piccadilly line around the time of the explosions. This little response posted and then quoted everywhere spoke so much of the way we are here and to my mind it does a fairly good job of capturing British spirit and dry wit. ''When the news reporter said 'Shopkeepers are opening their doors and bringing out blankets and cups of tea' I just smiled. It's like yes. That's Britain for you. Tea solves everything. You're a bit cold? Tea. Your boyfriend just left you? Tea. You've just been told you've got cancer? Tea. Coordinated terrorist attack on the transport network bringing the city to a grinding halt? Tea dammit! And if it's really serious they may bring out the coffee. The Americans have their alert raised to red, we break out the coffee. That's for situations far more serious than this of course. Like another England penalty shoot-out.'' Posted by Jslayeruk on Metaquotes LiveJournal. On that note, I'm away to put the kettle on; tea anyone?! Coffee please! It's a serious situation in my house - husband away and been up all night with a bed-wetting coughing toddler. And I'm full of cold. Woe is me. Actually, could you make it a lemsip? I do prefer coffee, but you're right, at moments of crisis, it has to be tea! Lovely quote and post too Jem. p.s. Preloved sounds great...wish we had it here. Someone said sometime...that the English had tea in their veins and that's why they drank all day, every day and why it's the first response to every crisi large or small. I agree! 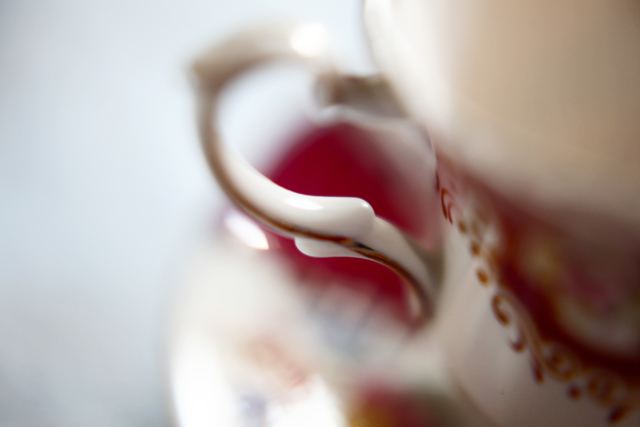 Cuppa tea, then? Shhhh don't tell anyone but I don't drink tea! 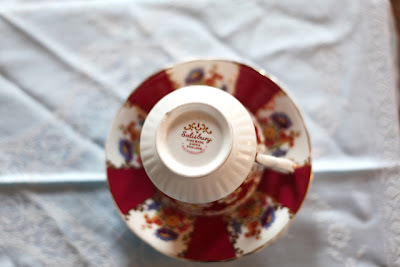 I have just picked up the china addiction however and just last week purchased my 2 first teacups and saucers. 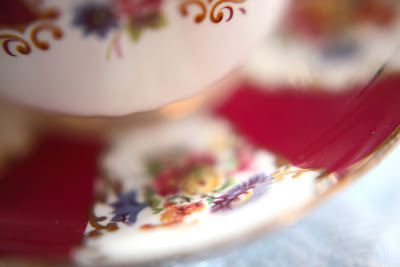 I adore this one of yours, the colour really sings to me.I wonder if it's any easier to get nice china in England and if it is as expensive as it seems to be here in Australia? Lovely tablecloth too, wrinkles and all. Oh Jem, I adore that teacup! 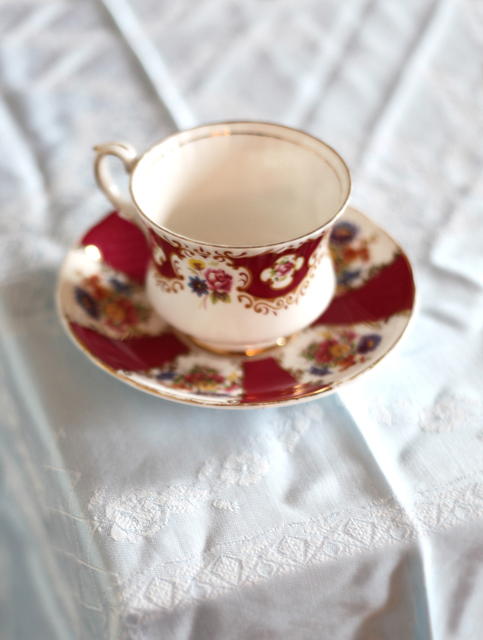 I have to admit I drink both tea and coffee from my English china! In my opinion everything tastes better in china!